8:03am A middle-aged lady dressed all in black is the only other passenger on the double-long articulated bus as we roll east on 103rd past the bungalows of the blue-collar South Deering community. 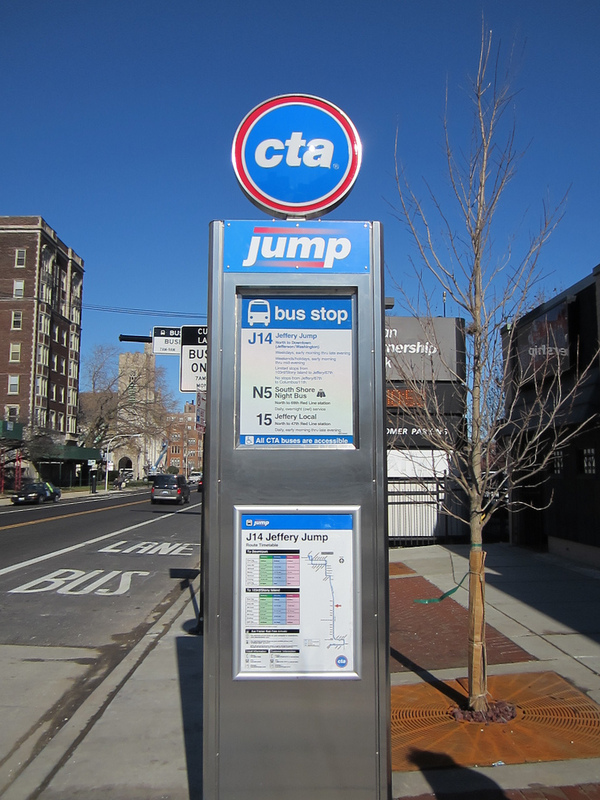 From here until 67th Street the Jump only makes nineteen stops, while the 15 Jeffery Local bus makes thirty-seven, so we’re only pausing every half-mile or so at stations with a blue paint stripe by the curb. Eventually all the stops will also feature nine-foot kiosks with route info and shelters with LED bus arrival times. We head north on Torrence Avenue, then roll west again on 100th Street, picking up a few folks on the way. At Yates a young man boards in a North Face puffer jacket, a hoodie and shades, despite the pea-soup fog. The next stop is Paxton Avenue, which will get a “Showcase Station” next year, a larger shelter with more seating and better weather protection, plus curb bumpouts to facilitate boarding. 8:07am After veering northwest on Van Vlissingen Road, the bus continues north on Jeffery Boulevard into the Pill Hill neighborhood, once a popular residence for African-American doctors from nearby South Chicago Community Hospital. At 95th Street several well-dressed, middle-aged women board, along with a few high-school students. A kid with dreadlocks and a baseball cap unsuccessfully tries to talk his way on without paying. 8:14am Car traffic has been flowing fairly smoothly so far. Around 84th Street we come to diagonal Anthony Avenue and the viaduct under the Chicago Skyway where Jeffery bottlenecks, often causing traffic jams. 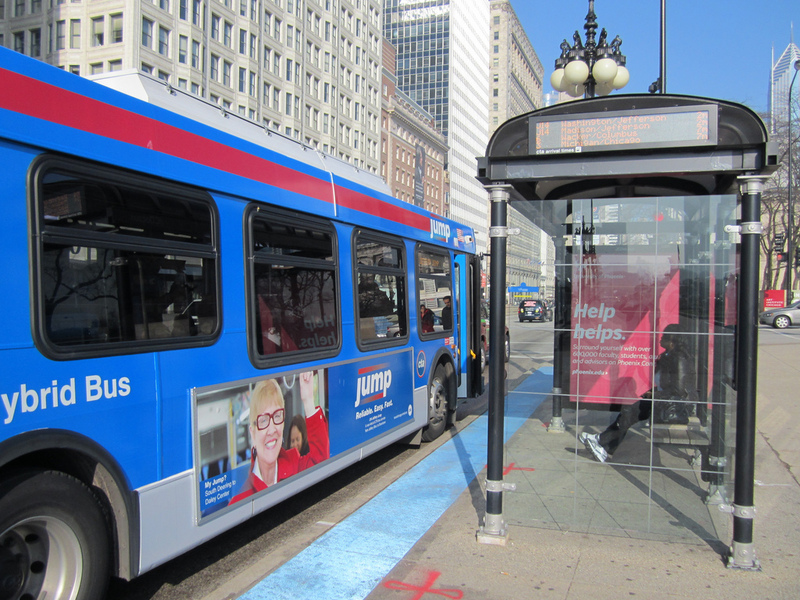 In 2013 the city will install a “queue jump” here, allowing CTA buses to cut to the front of the line via a special traffic signal and a bypass lane. Next year the stretch from the viaduct to 73rd Street will also get bus-priority stoplights, further greasing the wheels. 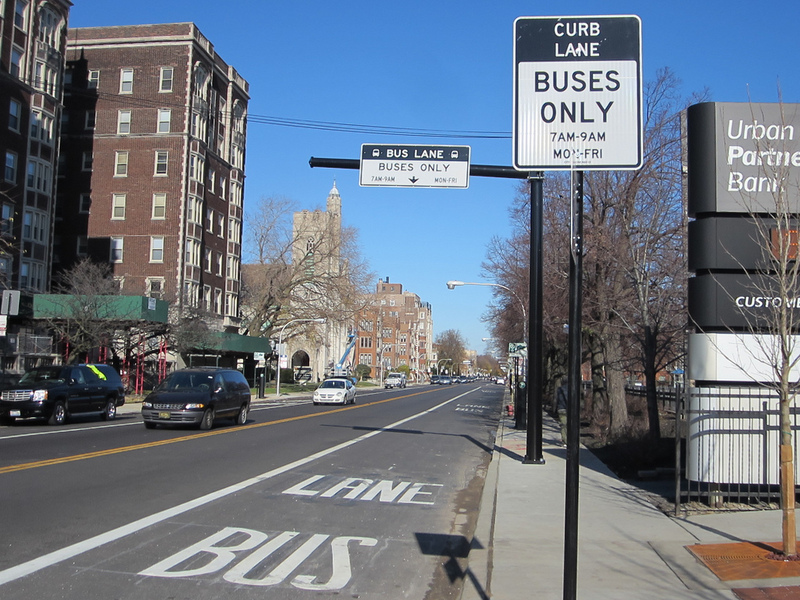 8:15am Just north of the viaduct begins a two-mile stretch of rush-hour-only bus lanes, from 67th to 83rd streets. From 7am-9am weekdays, parking is banned on the east side of the street to accommodate inbound bus traffic, and vice versa for outbound traffic from 4pm-6pm. While the center lanes are full of automobile traffic this morning, I’m happy to see no one is driving or parking cars in our bus lane. 8:17am At 81st Street a 15 Jeffery Local bus pulls over at a non-Jump stop, blocking the bus lane. Our driver merges left into the car lane, toots his horn twice to warn the other operator, then leapfrogs back into the busway. Our lane continues to be clear of autos and we make good time, although congestion isn’t much of an issue for car drivers either. 8:21am The fog has burned off by now as we roll through the middle-class South Shore community. At 75th Street a lady in an awesome leopard-print jacket comes aboard. I also note a heavyset guy standing stoically on the corner in a knit cap and a safety-yellow Chicago Public Schools Community Watch vest. 8:22am At 71st Street we encounter the first and only vehicle parked illegally in the bus lane, suggesting the authorities have been doing a good job of ticketing and towing. The scofflaw is a garbage truck owned by Diamond Waste & Recycling, whose slogan is, “Call us if you want to talk trash.” As I roll my eyes at the obstruction, two employees roll a dumpster out of the alley. 8:28am We enter the Drive at Jackson Park’s outer harbor, and begin zooming north in light traffic. I notice that the driver has a Jump brochure on his dashboard folded to show the route map. With the sun out we get beautiful views of the lakefront: 63rd Street Beach, Promontory Point and the Museum of Science and Industry, where we pause for a stoplight at 57th Street. 8:33am Continuing on LSD we pass the new 31st Street Harbor, where dead trees have been painted various colors and installed as art. Workers on ladders are placing a giant dragonfly sculpture among some ghostly white branches. As we approach the black monolith of McCormick Place, the gleaming towers of the Loop come into view. 8:39am Just after Soldier Field we exit Lake Shore Drive and make our first downtown stop at 11th Street and Columbus Drive, near a statue of the eponymous explorer. A few blocks later at Balbo Drive, the disembodied voice announces “Balbo” with the accent on the second syllable, and I realize I’ve been mispronouncing the surname of the Fascist aviator who famously led a transatlantic squadron from Rome to Chicago in 1933. 8:58am After cutting west on Balbo we turn north onto Michigan Avenue, past the lions of the Art Institute, then roll west down Madison Street through Loop traffic, stopping every quarter-mile, which slows us down considerably. When the driver drops me off at the terminus at Jefferson Street and Washington Boulevard, in the shadow of Claes Oldenburg’s giant “Batcolumn,” it’s exactly one hour after I boarded. I grab my bike from the front of the bus and cycle northeast to reward myself for my early wake-up with churros and hot chocolate at XOCO. In the Kinzie Street protected bike lane I happen to run into Chris Ziemann, the city’s BRT project manager, pedaling to work. I congratulate him that his express bus performed admirably and gave me a nice tour of the South Side to boot. 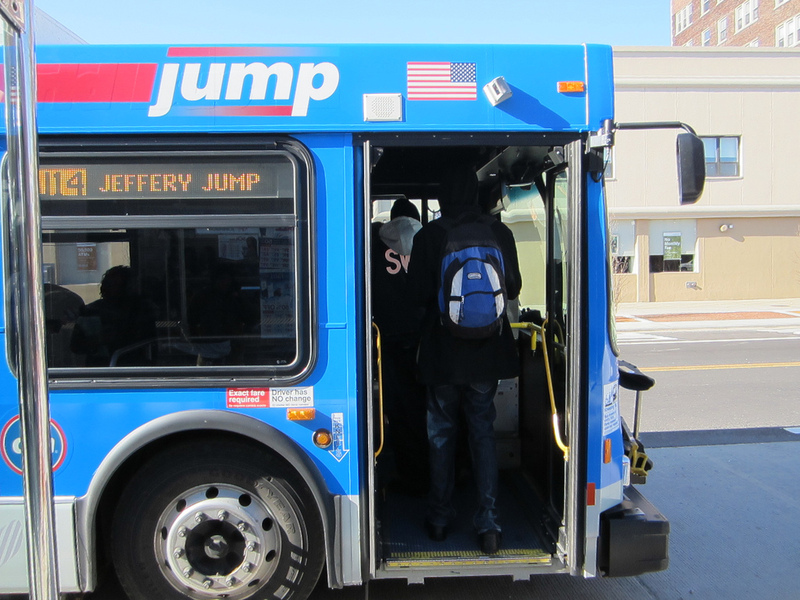 The Jeffery Jump may not be a quantum leap ahead of conventional bus service, but it’s definitely a step in the right direction. Chicago Critical Mass Join hundreds of cyclists for this monthly bike parade and demonstration for bike-friendly streets, for a leisurely pedal to a destination yet-to-be-determined. Friday, November 30, Daley Plaza, 50 West Washington, chicagocriticalmass.org, 5:30pm; free. Chainlink Halloween Party 2.0 Since TheChainlink.org’s original Halloween party was canceled due to permit issues, it’s been rescheduled at a more beer-friendly location. Meet up with some of the 8,000-plus members of the local bike-social-networking site for craft brews, food and a bike gear raffle. Friday, November 30, 7pm-10pm, Revolution’s Tap Room, 3340 North Kedzie, tinyurl.com/CLHalloween20; free. Heels On Wheels! fundraising party for West Town Bikes Help the youth from the bicycle education center’s Bike Club and Girls Bike Club raise money to attend the Youth Bike Summit in NYC at this shindig with a live DJ, dance performances, silent auction and more. Saturday, December 1, 6pm-10pm, Casa Puertorriquena, 1237 North California, (773)772-6523, westtownbikes.org; $10. I-GO 10th Anniversary Gala Celebrate the nonprofit carsharing service’s decade of helping Chicagoans live well without owning a car at this party featuring a presentation of the future of sustainable transportation in greater Chicago, a silent auction, refreshments, dancing and more. Tuesday, December 4, 5:30pm-8pm, Chicago Cultural Center, 77 East Randolph, igocars.org/igo10; $30, $20 for IGO members.